Welcome to the March 2019 ISAC Update for financial aid administrators and business officers. This version of the electronic ISAC Update is a compilation of e-Messages sent through ISAC's e-Messaging service throughout March. The articles in this Update have been organized according to the FAA subscription groups to which the messages were distributed. Questions regarding information in this ISAC Update can be directed to School Services at 866.247.2172 or at isac.schoolservices@illinois.gov. On occasion, you may be directed to a specific contact person or area; when this occurs, we will provide the appropriate information in the individual article or message. Sent to Financial Aid Directors, Financial Aid Administrators, Public Schools - Participating in the ING Grant and IVG Programs, and Business Officers on March 26, 2019. Sent to Financial Aid Directors, Financial Aid Administrators, MAP Users, and Business Officers on March 18, 2019. Unless otherwise noted, links in this message are to corresponding pages at the Illinois Student Assistance Commission (ISAC) website (isac.org). ISAC staff has been analyzing application volume and claim rates for the 2018-19 Monetary Award Program (MAP), and has determined that no additional records in suspense status will be released. All MAP grants for eligible students with an initial Free Application for Federal Student Aid (FAFSA®) receipt date on or after April 5, 2018 will remain in suspense status. Effective immediately, colleges may submit third-term payment requests (claims), as well as increases to previously-submitted first- and second-term claims, via the GAP Access portal and by File Transfer Protocol (FTP). Visit the MAP Payment page, located within the MAP section of the ISAC Gift Assistance Programs area, for more information regarding the claims process. All 2018-19 MAP claims for the third term, and adjustments to increase claims for the first and second term, are due to ISAC on or before June 1, 2019. All initial first- and second-term late claims will be held until after June 1, at which time analysis will take place to determine whether they will be paid. If analysis supports such action, late claims will be paid on a first-come, first-served basis. Therefore, colleges are encouraged to continue to submit initial claims for all terms. However, do not resubmit initial claims that have already been submitted, as the new (duplicate) record will overlay the previous record and the submission date will be changed to the later date. Note that decreases to previously-submitted first- and second-term claims continue to be processed. Watch the FAA Message Board, the MAP Program News area, and this e-Messaging service for the most up-to-date information, including a future announcement regarding whether late claims will be paid. Sent to Financial Aid Directors, Financial Aid Administrators, Public Schools - Participating in the ING Grant and IVG Programs, MAP Users, Business Officers, and FFELP Administrators on March 12, 2019. We look forward to seeing you during the upcoming Illinois Association of Student Financial Aid Administrators (ILASFAA) annual conference – "Hats off to ILASFAA: Celebrating 50 Years!" – being held March 18–20 at the President Abraham Lincoln Hotel in downtown Springfield. You won't want to miss out on this opportunity to honor the past, embrace the present, and build for the future with your friends and colleagues. Please stop by and visit with us at one of the following sessions at which Illinois Student Assistance Commission (ISAC) staff members will be presenting. Once on site at the conference venue, refer to the conference program to verify the time and location of each session. For more details regarding the 2019 ILASFAA conference, visit the conference mini-site at the ILASFAA website. Sent to Financial Aid Directors, Financial Aid Administrators, Public Schools - Participating in the ING Grant and IVG Programs, MAP Users, Business Officers, and FFELP Administrators on March 4, 2019. 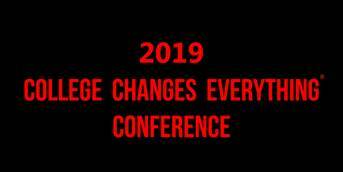 Interest session proposals are still being accepted for the 2019 College Changes Everything® (CCE) conference: Expanding Success for All Students – Every Community’s Responsibility. We cordially invite you to complete an online session proposal form by the priority consideration date of March 8, 2019. As in years past, we are happy to have presentations on a broad range of topics, which do not have to connect directly to the conference theme. We encourage proposals that focus on, but are not limited to: college and career readiness; student retention, persistence, and completion; education, business, and the economy; and college costs and affordability. Sessions should provide in-depth information, practical ideas, and specific strategies for the audience, and demonstrate and promote positive steps taken to address these issues and sharing of specific lessons learned. For further information about proposal submission and the conference, please visit the conference website. We look forward to seeing you on July 18, 2019, at the Tinley Park Convention Center, Tinley Park, Illinois. Registration for the conference will open in May. Please consider sharing this call for proposals with your colleagues. Sent on March 1, 2019. The February 2019 edition of the ISAC Update is now available for your review, and may be accessed via the Partner e-Messages & Newsletters section of the e-Library at isac.org. This version of the electronic ISAC Update is a compilation of e-Messages sent to financial aid administrators and business officers via ISAC’s e-Messaging service over the past month.